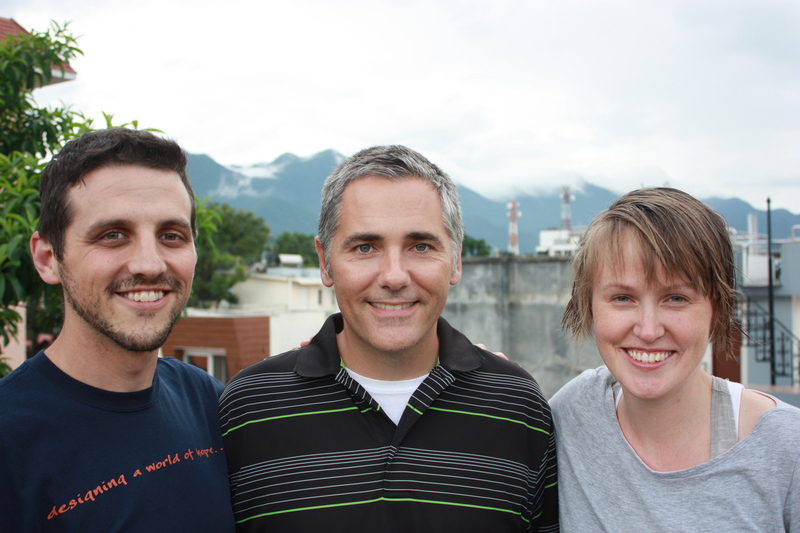 The final days in Nepal were a bit of a blur as we switched into deadline mode to produce a draft of the training guide to present before we left. 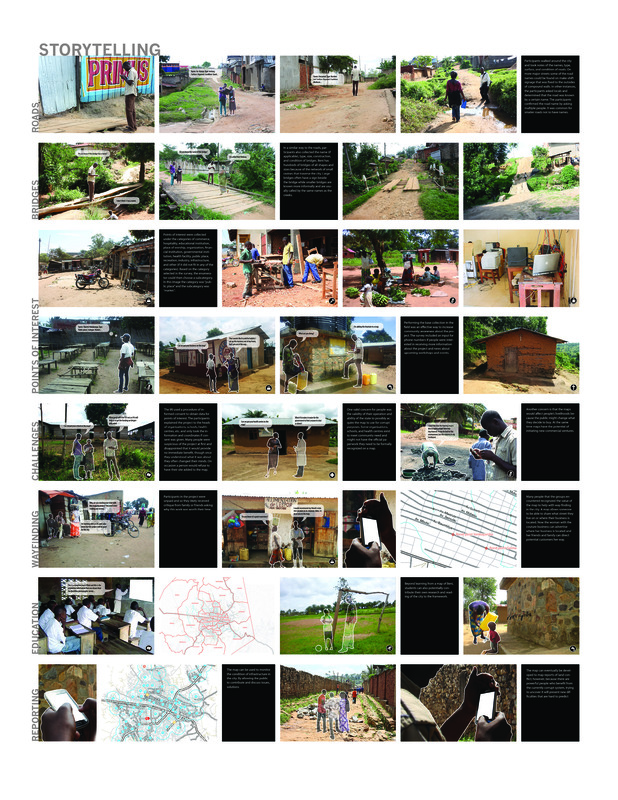 I hand-drew all of the drawings, scanned them, and then added the text and dimensions in InDesign. It was fun to draw by hand after so long! It also allowed me to produce the drawings fairly quickly. 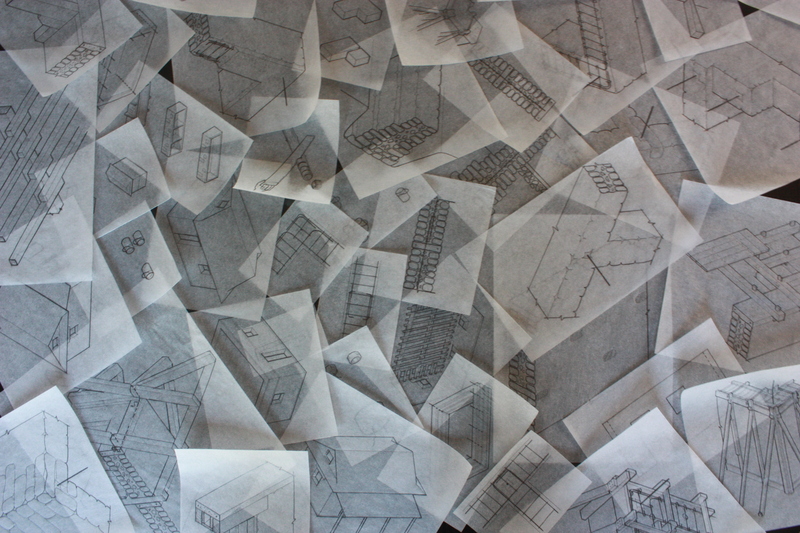 I drew mostly in isometric so that people unfamiliar with technical drawings would be able to understand the details. On Wednesday afternoon we presented, and that same evening we caught our flight home. The winter term has just finished up and spring term has begun. I enjoy this time because it is a chance to recharge, set new goals, and it is also a break from the regular schedule of classes. Because I had more free time, I made it to Toronto for two consecutive weekends to meet with friends and do various activities. You can tell it is spring when Toronto starts waking up with events of all kinds! May is also quite a birthday month and so there are many moments to celebrate being alive! Two weekends ago I had opportunities to attend Pulp Paper Art Party, a launch for the sixth publication of Scapegoat, and the Gladstone GrowOp exhibition. You may remember that I went to Pulp Paper and Grow Op last year. I didn’t make it to Pulp Paper this time because I couldn’t find a place to stay on Friday night and also needed to finish up one last paper. I headed to Toronto on Saturday evening and met up with Farimah at Strada241, a great Italian restaurant on Spadina, for dinner. Afterwards we walked the backstreets southwest of Spadina and Dundas to find Unpack studio where the opening was happening. The book launch was for two different publications: Scapegoat 06 and Architecture in the Anthropocene. It was a lot of fun to meet new people and also see a few familiar faces. I stayed at Farimah’s place that night in Thornhill and woke up early the next day to give myself the hour it would take on transit to get to church. After church a group of us were gathering to get lunch, and then the Mugg’s offered to host us at their place. We had a fabulous lunch of salad and sausages and good fellowship. When we headed our separate ways, I decided to drop by the Gladstone Hotel to catch the last half hour of the Grow Op exhibition. Since there were only five minutes left by the time I got there, they let me in for free! I don’t have any photos of this weekend because I’m still without a camera, but here are pictures of my favourite Grow Op pieces: The first is called Crusher Run, triple mix and bark nuggets, a beautiful framing of layers of earth, and the second is Catharsis by Marie Pierre Daigle. I think the second one was part of a different collection on the third floor that was more related to textiles. Next on the itinerary was to head to Parkdale to a bar called The Pharmacy to meet two girls from U of T who did their graduate theses in the DRC. 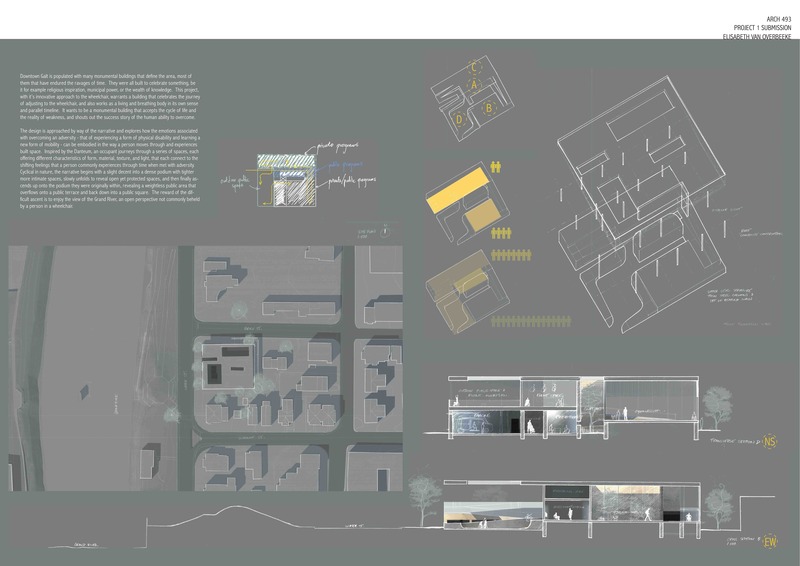 They partnered with their research to propose a design for a vocational school in Nyalebbe in the Ituri province. It is located several hundred kilometers north of where I will be working in Beni. It was really great to hear about their experience. 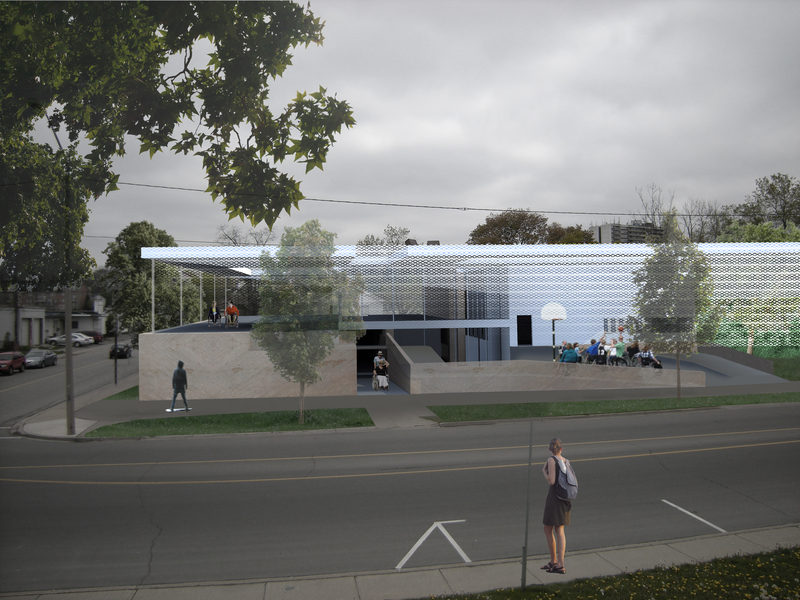 They created a studio called Reach Architecture in the process of doing this project and hope to build the school when they have gathered enough funding. I was lucky to have a place to stay with Jen from church for the night because it would have been very late to head home on the Greyhound that night. I left mid-morning instead back to Cambridge and ended a very wonderful weekend. I’m pretty sure I just recovered for most of that day! The following weekend was slated to be just as full and exciting. On the Friday night I went to a party in the Loft that was made up of a lot of architecture alums who are working in Toronto but also a few others who came in from Cambridge. It was also a night of musical talent. We heard some amazing drumming, spoken word, and combinations of ukelele, guitar, and violin! It was fantastic! It only inspires me to play guitar even more and to hopefully write my own music and learn the violin some day. I stayed at the Logans that night and count myself fortunate to have a place where I could arrive late and let myself in quietly. The next morning I was surprised with a treat of a waffle breakfast because several of their friends from Grace had come to help Mike move some big boulders in the front yard. Then on a wim I joined a car that was headed to Guelph to check out Rob Hengeveld’s exhibition opening. I had most of the day to kill anyways so what was an hour drive to Guelph and then back? Rob is an artist from my church who does pieces that question the relationship between technology and nature. I really enjoyed his pieces. He had a sculpted hilly lawn that was being constantly mowed by a programmed milling machine. He also had a fairly large working roller coaster that had a mechanical wolf chasing a mechanical rabbit. My favourite was a fabricated elevator that almost looked convincing in a wall at the gallery, but instead of taking you to another floor, it brought you to level “P” for “paradise”. When the doors open you step out into a room that is transformed into a fabricated natural environment. The room is filled with different mechanical elements simulating nature such as mechanical tweeting birds and moving floating ducks on water. Once you are on the other side you can see that the elevator was completely constructed and that it simply pulls away from the original door, rotates, and then pulls up to a platform on the other side. I thought it was a great experiential piece that told an interesting story. The next completely different part of my day was to return to Toronto and head to Yorkville to meet Vikkie, Rachel, and several of her friends at Babaluu for dinner and Salsa dancing to celebrate Vikkie’s birthday. Oh… not before I hung out at a very busy Timmie’s for two hours to kill time and transformed myself in their grungy bathroom by changing into my nice dress and putting on makeup! Now that’s typical nomad style! I’m glad I dressed up because Babaluu was very classy (at least for the dinner portion). We all ordered tapas to share and the food was delicious! At nine-thirty there was a teacher who began to teach some latin dance steps; there were too many people though and so I don’t think anyone learned much. I must say I had a better dance experience at the Plaza Flamingo when it was open and the Lula Lounge, two other Salsa clubs in Toronto. It was way too full in the place to even dance properly. Overall though it was still a nice evening to spend with some great people. I stayed with the Ellens that night which worked out because I was to join their Grace Gathering breakfast the next morning. We woke up pretty early and made delicious breakfast sandwiches and were joined by Rosy and the Muggs. Then we all headed to church together. 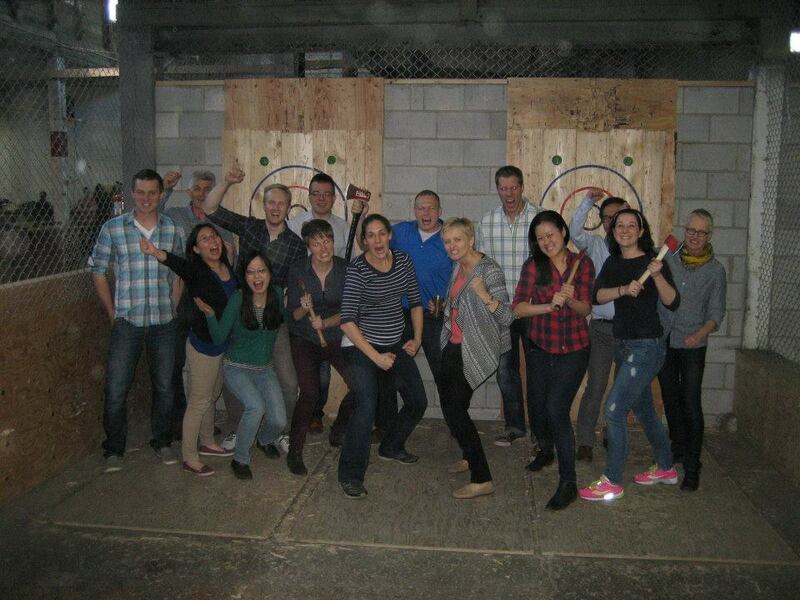 After church I headed with the Wills to join the axe throwing party to celebrate Leah and Benissa’s birthday. 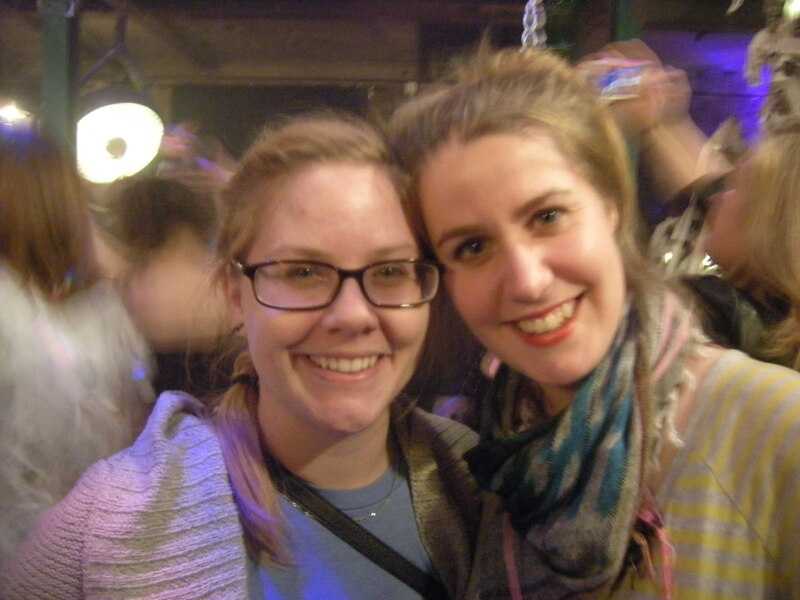 I actually didn’t know Benissa until that day but I am glad I met her! 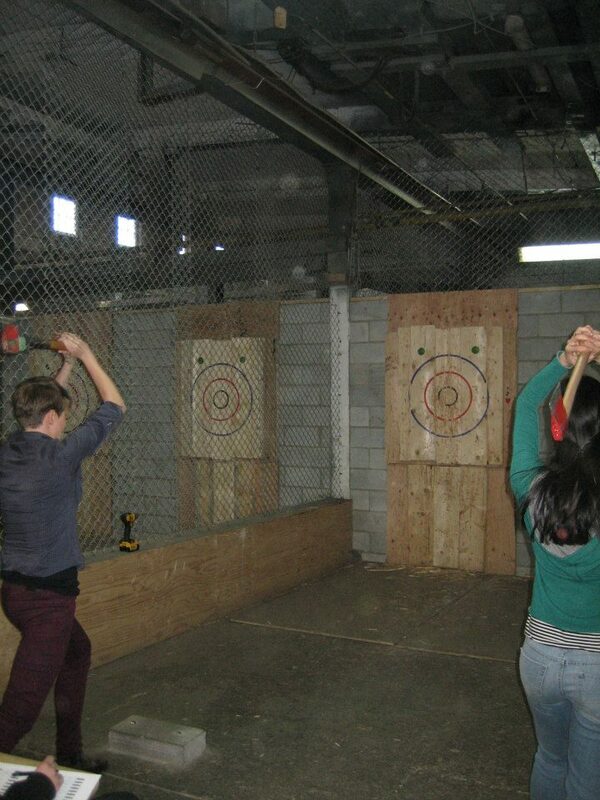 The party was at BATL, the Backyard Axe Throwing League located at the Docks. I already knew there was such a thing because there was a small axe throwing club in the building where I worked for Philip Beesley in the Junction Triangle. It was way more fun and less scary than I thought it would be. That doesn’t mean that I was any good, but I did manage to sink several into the wood somewhere close to the center of the target. All of us got a chance to practice for a while, and then they arranged a round robin tournament. The action of throwing the axe is a similar motion to soccer throw-ins. My abs were sore for several days after! Whenever there was a tie, it would have to be broken by the competitors throwing the full sized axe. Those of us who never experienced a tie got to try throwing it at the very end. I managed to get it into the target even though it was dangling slightly. 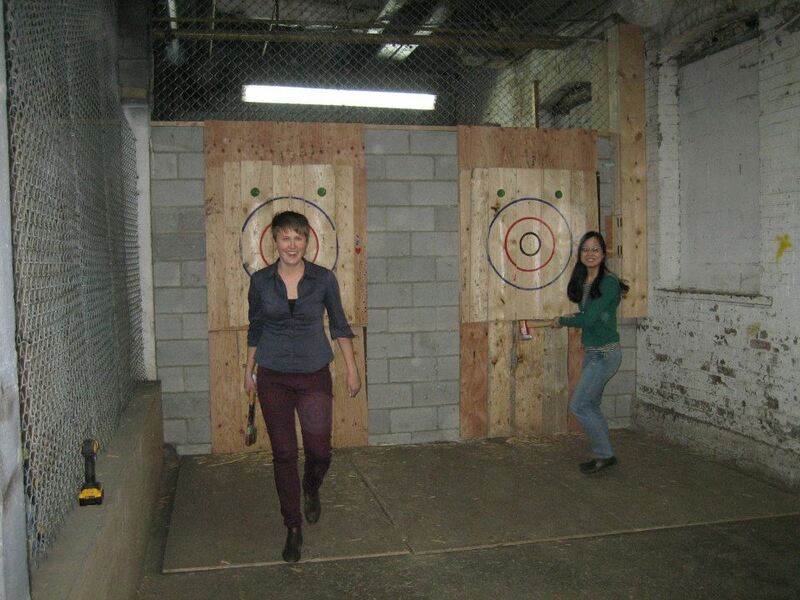 I would definitely do axe-throwing again! It’s a much more fun (though more expensive) party activity than bowling! That about sums up my two crazy Toronto transition weekends. Don’t you know that these are all the rage? If only there was such a thing as grow pulp wolves. I was just trying to put the names together from my activities of this weekend. Toronto is a city full of so many interesting sights and sounds. I am always in awe of what the human creative mind can invent! On Friday night I went to the Grow Op event that I advertised in an earlier post. I was mistaken when I said that our Field Cushion project was going to be exhibited… rather strange, but they just used it for the promotional material and that was all. It was false advertising I would venture to say. The event was a lot of fun, but I must admit I was disappointed. It wasn’t anything new really and it wasn’t about exploring landscape and place like I thought. Nope, it was a plant version of Come Up To My Room. Rather than questioning what landscape is and can be, it was a series of metaphorical artworks and objects that incorporated plants. Blah. In fact it was only the Waterloo team F_rm Lab that managed to try anything of the sort, but even then it still looked too much like a decoration to me and not a landscape. It didn’t have any power over the space because the busy lobby of the Gladstone overpowered any effect it could have had. My favourite piece of the evening was ‘Fluorescent’ by Jane Hutton and was exhibited in a darkened bathroom. 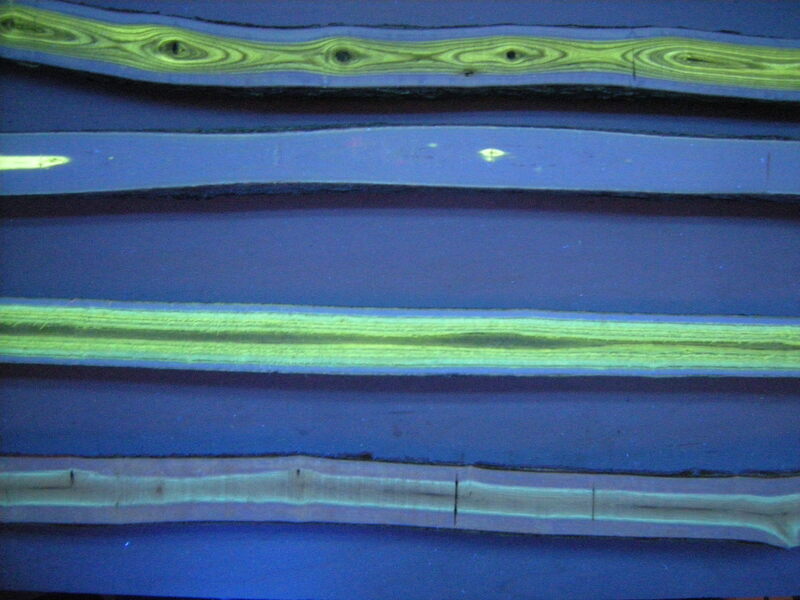 It was nothing but a black light shining on some sliced sections of branches. I didn’t know this, but certain species of trees absort and emit different and subtle levels of light. Even though these branches were simple objects, when they glowed they made the space feel surreal. They in themselves created interesting landscapes of contrasting patterns of rings, spots, and lines, that if one did not see them sliced in two and exhibited in this way one would never know how much they actually differ. This ‘Babylon Light’ by Ryan Taylor is a neat idea. 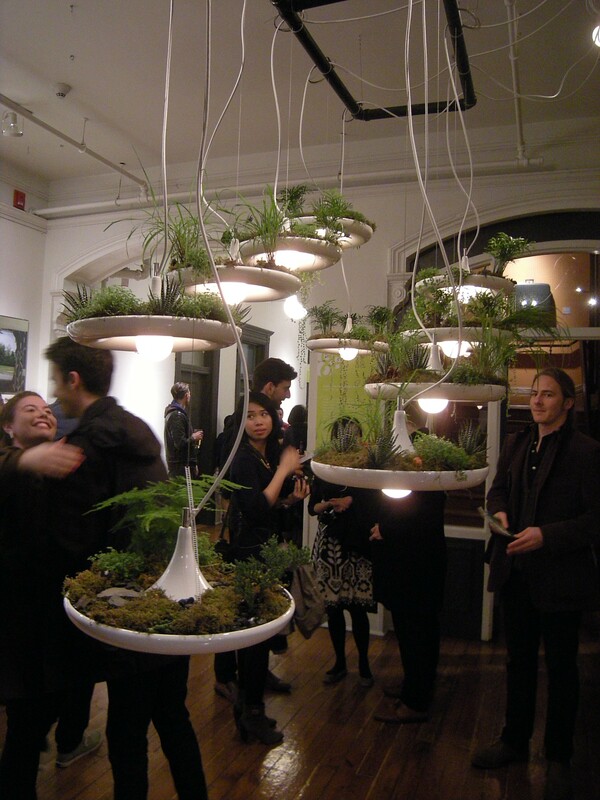 I also liked the ‘Knitted Garden’ (of which I do not have a good photo) by Mehran Ataee and Dylan Uscher. The second event of the weekend was on Saturday night when I went with a group of friends to a ‘Pulp Paper Art Party’ organized by Architecture for Humanity. I was looking forward to seeing how paper could be used spatially in new ways and imagined being in a space surrounded by paper where a person could manipulate it by ripping it, folding it, and drawing on it. 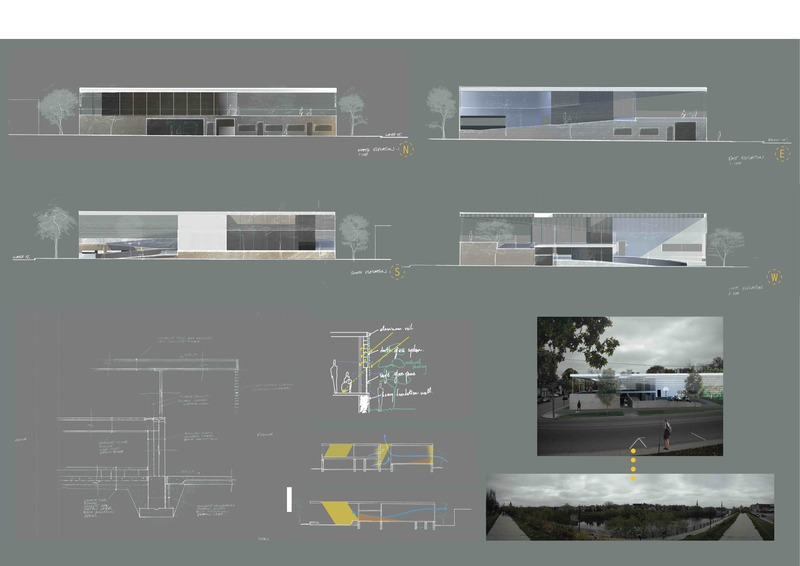 I was also a little disappointed for this event as well (Sorry but I must be the architectural critic). When they could have done sooo much with recycled paper and created a cool interactive landscape, all there was were little ‘stations’ so to speak. The only paper item that actually carried through the space were these paper snowflake-remeniscent streamers hanging down randomly in the space. Maybe there was fire code issues and they couldn’t take it that far? In my opinion if it wasn’t for the music the event would’ve been a flop. 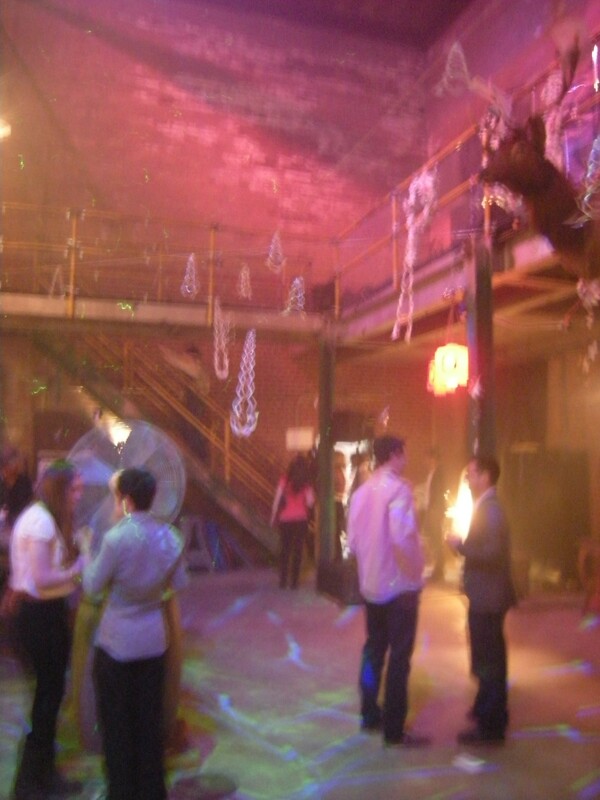 The live music was FANTASTIC and so was the space which was an old brick industrial building in the Junction neighbourhood. A group called ‘Lemon Bucket‘ performed and they very appropriately describe themselves as a, quote, “balkan-klezmer-gypsy-party-punk-super band”. My favourite ‘paper decor’ of the evening were the scraps of paper stabbed onto the antlers of the gigantic stuffed deer head hanging off the center of the mezzanine. The building was an amazing triple-height space. 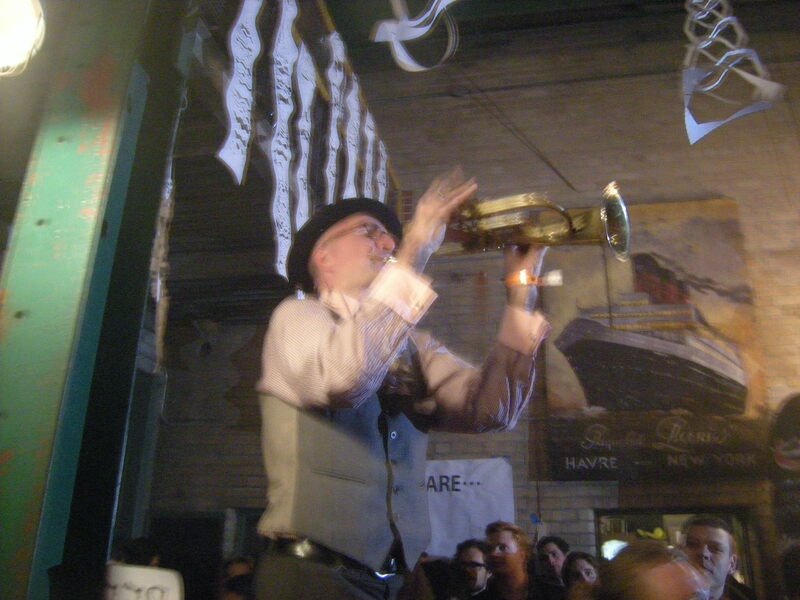 Unfortunately we were limited to the ground floor, but got to enjoy the band playing on the mezzanine above us. Jen and her friend Danielle were visiting for the weekend and came along. Not only do they look stunning in this picture, I am also particularly proud of how clear they are while there is nothing but movement behind them (hooray for steady hands!). And it’s true, there were people dancing a mile a minute behind them! It was particularly cool, when near the end of their performance, the band came down and started playing right in the middle of the crowd. 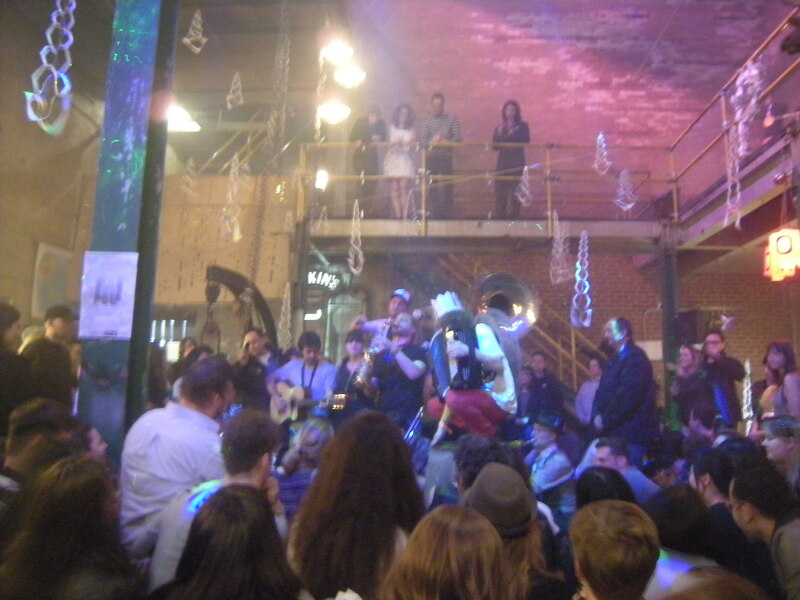 There was even a point when they managed to calm everyone, got the crowd to sit down, and sang acapella. We stayed at the event until the music performance had ended, and then headed back to my place. For my friend Vikkie and I the night was not yet over. 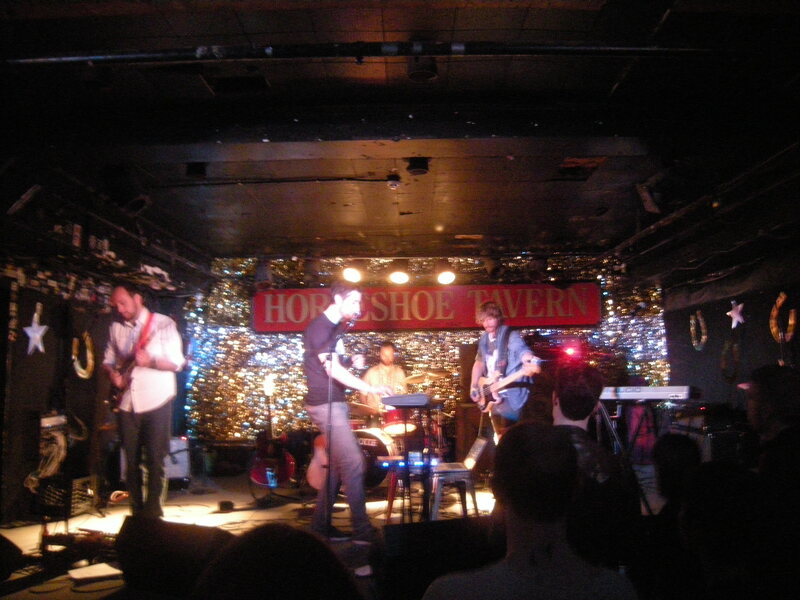 We headed down to the Horseshoe Tavern at Queen and Spadina to see the Ketch Harbour Wolves play. They introduced a new album with songs inspired by Toronto. Even though I can never understand the lyrics, I really enjoy the music because it does indeed evoke feelings about places. Check this out! Not only is our Field Cushion project going to be exhibited in the Grow Op landscape exhibition at the Gladstone hotel at the end of April, we also had a photo selected to be published in the promotional material! Feels good to finally be published, even if it’s just a poster! Come on out to the exhibition from April 25th to 28th. I have been home for over a month and my experience in Uganda is already beginning to feel like a dream. It will forever be with me however, and I was definitely blessed and changed by it. What’s strange is that I always say the word ‘home’ even though I’m always living the life of a nomad. I almost get frustrated at how adaptable I am and how easily I can adjust to a new place. I have fallen in love with every place I have lived and I can’t seem to pick one over the rest. Because I have called so many places home, I now have a good reason to write about my ‘home’ here in Cambridge where I am going to school for the summer. I have lived in this city on and off for the last five years as I have worked to finish my bachelor degree. 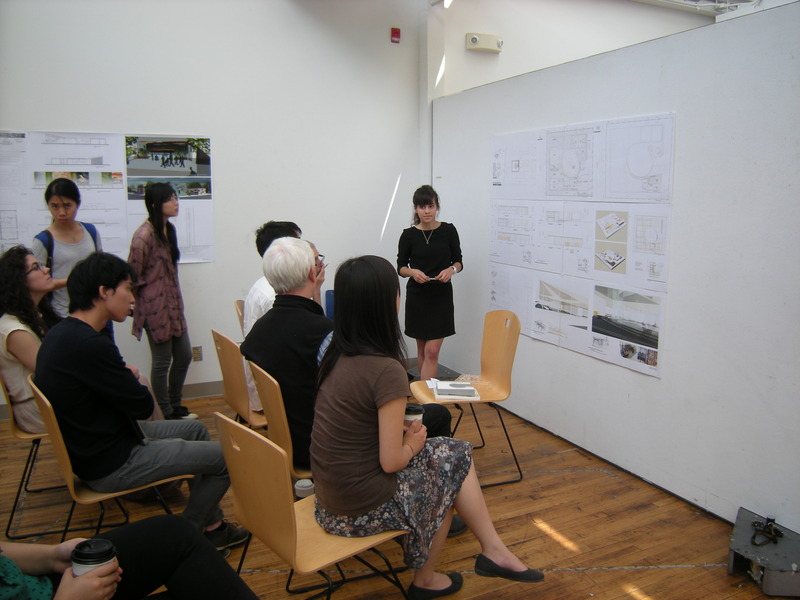 The architecture building is a renovation of what used to be a textile factory. We are about a half-hour drive away from the main university campus, and so we are a small tight-knit community of our own. 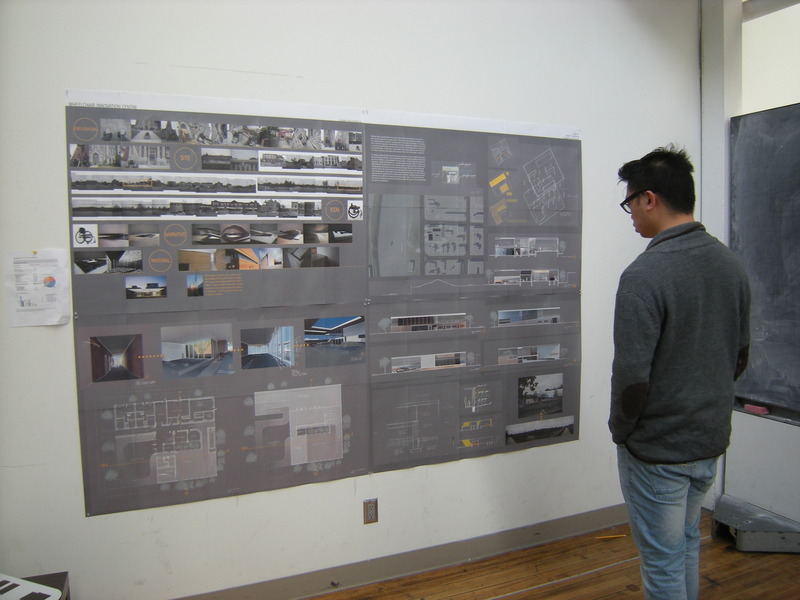 This past Thursday I had my first studio project review. 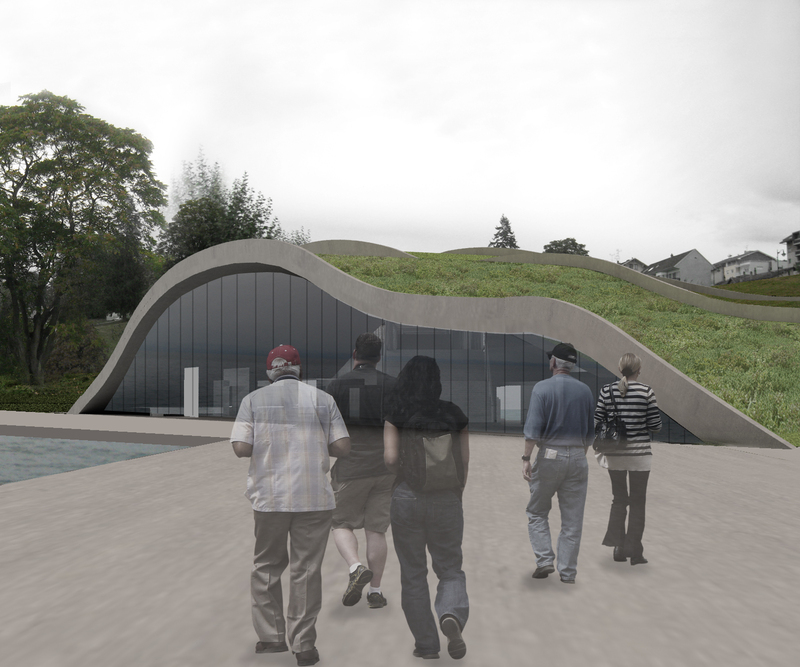 We are designing a type of rehabilitation center for people transitioning to the use of wheelchairs. 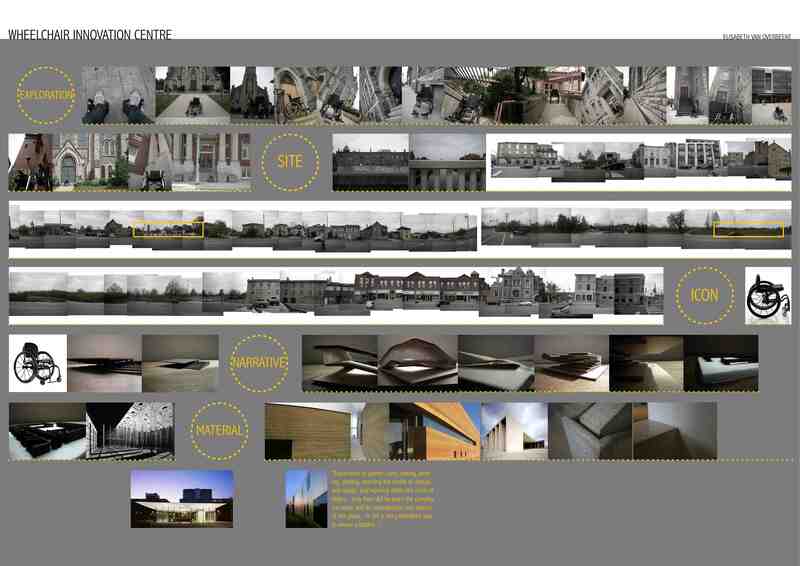 You can check out my project boards below. Just remember that this is the project at a developmental stage and that there is much more to be done! Enjoy! So by now if you have been following along with my Roman adventures, you are probably wondering if I have to do any work here. Classes have been going for three weeks now, but the amazing thing about this term or at least this month, is that our coursework is very intertwined with our discovery of the city of Rome. Our studio is a small rented space located in a building on the ‘Piazza Santa Maria’. Even though the facilities themselves are very minimal, it is the ‘backyard’ that provides the inspiration anyways! 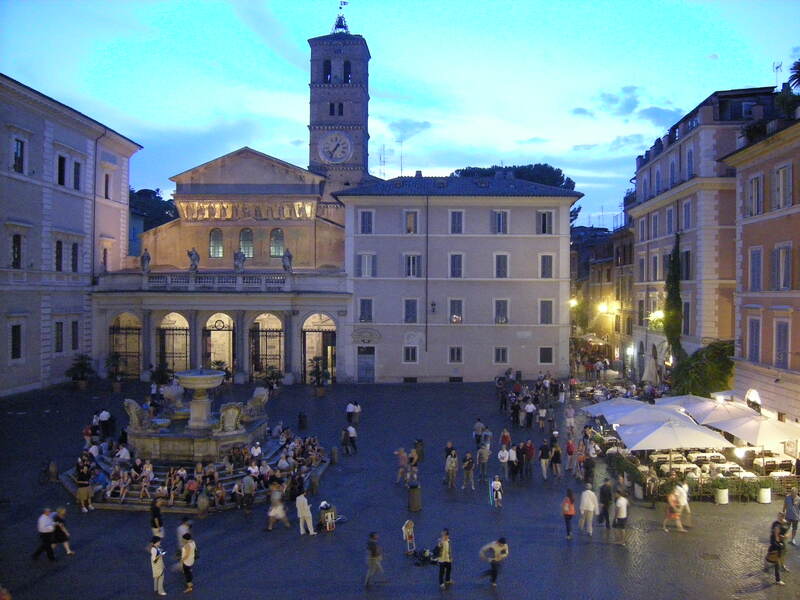 The piazza that we look out on is one of the most popular in Trastevere. It is filled with stores, cafés, and restaurants, which means there is never a dull moment. There is a beautiful church and a fountain on the square as well which together become an important landmark and meeting place. The square becomes even more alive at night, as Italians eat quite late and the square is often used for performances of various kinds. When I work late in the studio I can often hear the sound of a violin or an accordion playing, and once in a while some theme music to an upbeat music or dance performance. It will be interesting to see how the life in the square changes as the cooler weather arrives. Enjoy and please leave your comments! For anyone who missed seeing the sculpture, here are some links to pictures of and articles about the ‘Sargasso’ installation by Philip Beesley Architect that was up in the Brookfield Place for the LuminaTO Festival. 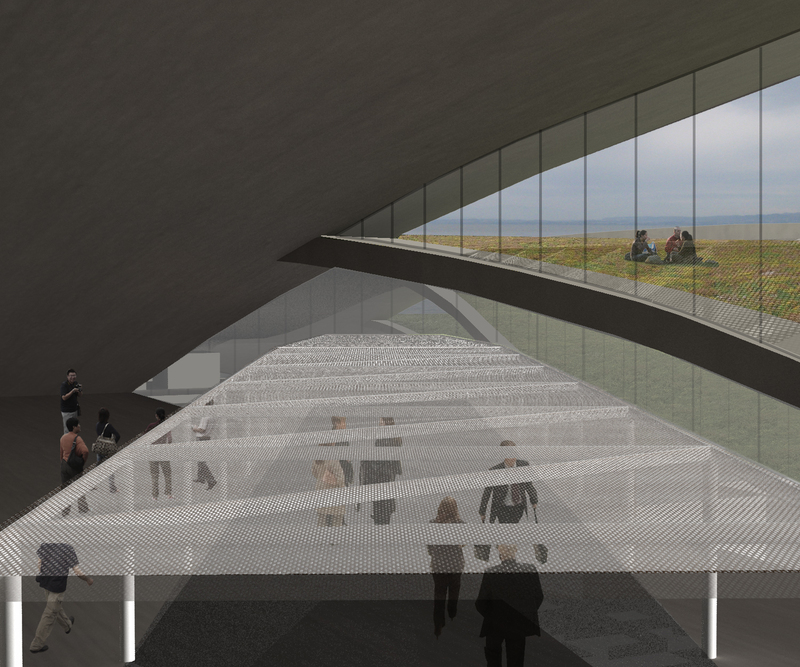 I did a lot of coordination for the project and designed several of the components. Enjoy! 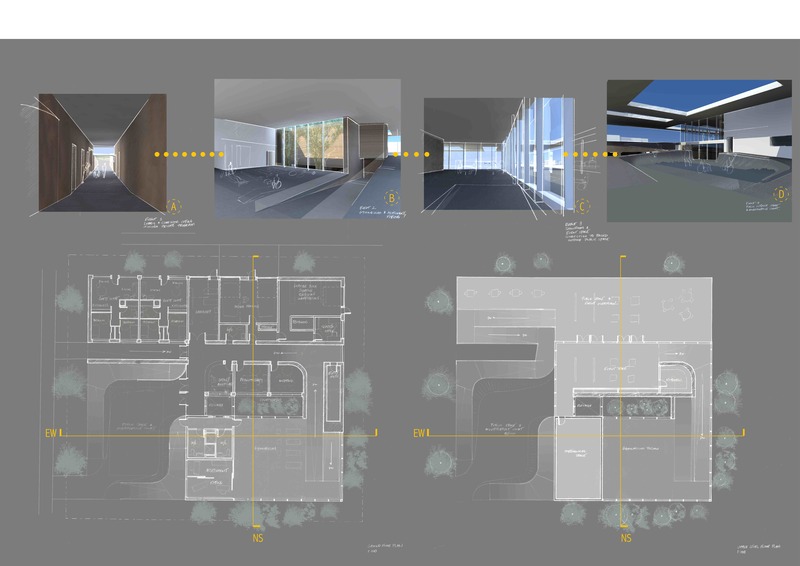 The following images are some of the perspective views that my partner Anne and I produced for our studio project at EPFL. Enjoy and leave your comments and critiques!